Data is a very important part of any business. And taking data-driven decisions is the best way to minimize risks. Today, there are tons of tools that perform revenue and subscription analytics for PayPal, Stripe, Braintree, and others. Some of the known tools include Baremetrics, MainMetrics, ProfitWell, etc. But the main drawback of these tools is they don’t provide subscription and e-commerce analytics for PayPal; (ironically) the largest Platform in the world. Only Putler, GetControl and ChartMogul are among the renowned tools that provide both subscription and e-commerce analytics for PayPal and other e-commerce systems as well. Yes. On 14th January 2019, GetControl officially shut down. So the only GetControl alternatives that do Subscription Reports for PayPal are Putler and ChartMogul. We’ve already covered one of the GetControl Alternatives – ChartMogul in brief here. So we thought of doing a similar one-on-one article comparing the GetControl Alternative – Putler. as well. This comparison would be great for people who are looking for a GetControl alternative for their PayPal reporting. Firstly let’s begin with reviewing GetControl’s dashboard. The key dashboard for SaaS metrics. It drilled down all the important SaaS KPI’s like MRR, ARR, Churn, LTV and few more. Every metric was further broken down into important sub-KPI’s and comparison charts. This made it really simple to get a complete overview of whichever SaaS metric you want to focus on. Straighforward dashboard. It provided a list of customers, their LTV and their payment information. Every business is interested in knowing the charges it incurs daily. So GetControl had an entire dashboard dedicated for charges. It listed down important metrics – charges which get approved, declined, refund etc. Charges also had a list view of all the sales and their statuses. Putler similar to GetControl handles both PayPal and Stripe. But it’s not just restricted to SaaS metrics. Putler provides analytics for both SaaS as well as non-SaaS businesses. It has 9 dashboards all focusing on various aspects of a business. This dashboard provides an overview of your entire business. It pulls in the most important performance indicators of your business and displays it at a single place. All the sales KPIs like net sales, refunds, avg revenue/day, avg revenue/sale are readily available. Plus, Putler also provides in-depth information on every sale along with the invoice. If needed, you can also export this sales list as a CSV and use it for further analysis. 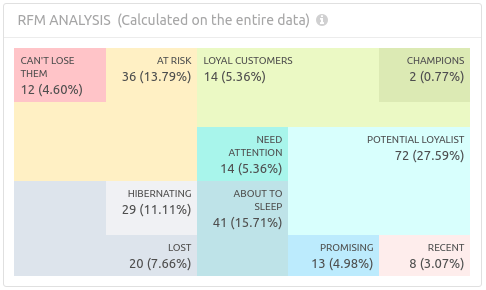 A unique feature in Putler is something called the Sales Heatmap. Putler looks at the sales activity on your site and plots a heatmap notifying the best and worst sales periods on your store. This insight can be used to plan out flash sales, live chat hours and tons more. This dashboard is specifically for SaaS businesses. It gives you all the SaaS metrics like ARR, MRR, churn, LTV etc. As the name states, it provides reports about products. The products dashboard gives key insights into the performance of every product. It ranks products on the basis of the sales made. Putler also gives in-depth information about individual products like the sales history, people who bought it, items that are frequently bought together and lot more. Similar to products, Putler gives detailed insights into the customers as well. Just like GetControl, it provides information about the customer, their personal details, sales details etc. But it provides something even more powerful – the RFM segmentation. This dashboard gives you the whole view of all the activities (not just sales) that happen on your website. Another cool feature that’s unique only to Putler and no other analytic tool in its genre is Google Analytics reporting. The audience dashboard pulls in the most important metrics from GA and displays it. 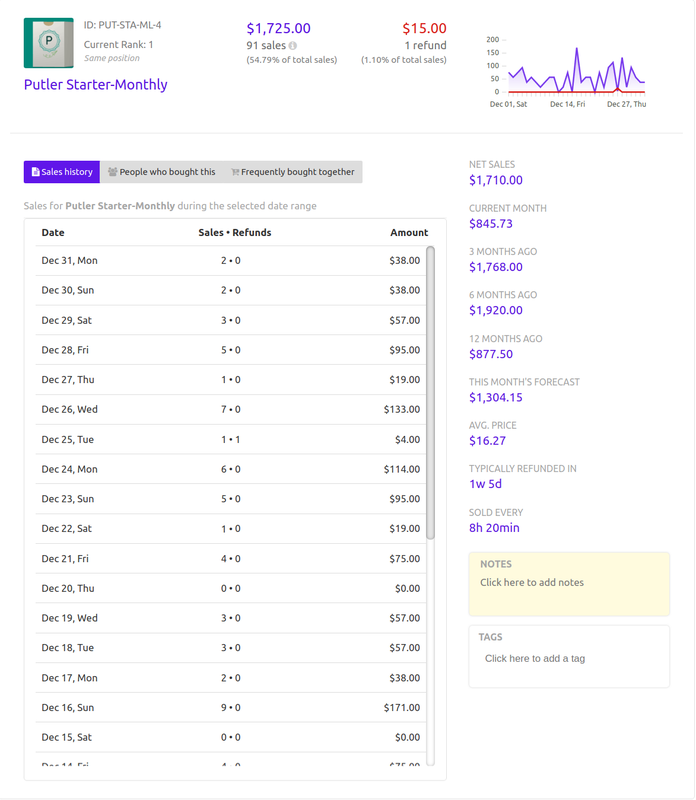 This dashboard allows you to forecast monthly revenue, customers and the 10X formula for your business. Putler goes a notch higher with this dashboard. It keeps adding useful practical insight reports that help decision makers make better decisions. Till date, there are two insight reports released by Putler. Holiday Sales Insights – Putler compares the business performance during holiday periods like – Halloween, Thanksgiving and Christmas. These insights help you understand sales trend during the Holidays and enable you to make data-based decisions. Leading to improved sales. Comparison Insights– Businesses often want to compare their business performances. Putler makes this task easier by generating comparison reports of all important KPIs at a single place. Both these tools integrate with multiple services. On the other hand, Putler directly integrates with multiple payment gateways, shopping carts and more. A business having multiple gateways, shopping cart systems find it difficult to view reports from multiple sources. Both these tools solve this issue by pulling in data from multiple sources, analyse it and show reports. Both tools are capable of handling multiple data sources well. GetControl won’t handle deduping as it’s all payment gateways. But Putler has an edge because it allows you to connect both payment gateways and shopping cart so that you get more insights into your data. It also removes duplicates using it’s deduping feature. Coming to consolidation… it does help save time. And both Putler and GetControl can consolidate data from multiple data sources and show combined reports. However, at times you may want to see reports of individual data sources, individually. In such cases, Putler has an upper hand. Putler lets you view independent reports of each of the data sources individually. For example: Peter has connected a Stripe Account, a PayPal account and a WooCommerce account to Putler. So he can view consolidated data and get combined reports from all these data sources in Putler. And at the same time, simply click a button and get individual reports for Stripe or WooCommerce or PayPal. So Peter never needs to visit Stripe/ PayPal/ WooCommerce to keep an eye on this data ever again. Simply log in to Putler and the job is done! Cool right? Sign up for the 14 day free trail of Putler and see for yourself. Running a business plainly on intuition is like shooting in the dark. Right? Still, we tend to do it every day. Mainly because, it requires us to look at analytics, understand the reports and then come up with strategies. What if all this was automatic? What if, there was a system which took care of analysing your data, making strategies and alerting you about what action you need to take? Something like this would be crazy right? Putler is planning to implement something so crazy. But that’s in the near future. For now, Putler sends a weekly email showing you that weeks important metrics. This helps you keep an eye on what’s happening in your business. Also, you get valuable content that can help you maximize profits and implement strategies. GetControl was more like a security alarm. It sent alerts to customers whenever it spotted a fraud in the customer’s system. Though both these services provide alerts for different purposes. They both have one thing in common – it’s the Sale Alert. That is whenever there is a new sale made you will hear an alert. Analytics is an important area essential for the growth of any business. And if you are running your business on PayPal, these reports are something you need. Now that GetControl is shut, you have two alternatives to look for Puter or ChartMogul. And to make this decision anxiety-free, I recommend you Sign up for the 14 day free trail of Putler. No credit card/ coding required. Just a few minutes and you will be able to get a clearer picture of your business. So don’t wait any longer.